I have found another application in my iPod touch in regards to earning points and exchanging them with gift cards. It is very easy to do, since I have always carried the device with me, whenever I have the chance to check it and earn more points, the faster I earned up and gather it. 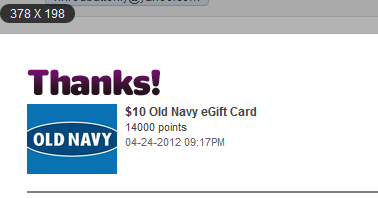 I was happy for the very first time, I got a $10 Old Navy eGiftcard, I can take it to the store if I want to buy in the store or simply I can also use it online too. So, here it is the proof and fruit of my labor. Although, it is not that big, who else on earth is giving you free stuff, whereas you can do it easily and since you are always on the computer, then might as well do something worth it. If you are interested, let me know. Message me and I will give you the link. that is great you can get a $10 egift Card, anything free is awesome.